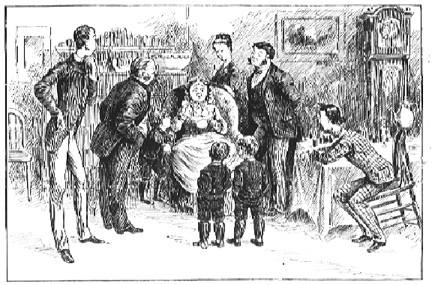 We present a charming little story concering the world's most absurdly bonehaeded family, the Peterkins -- from 1880 -- 'Mrs. 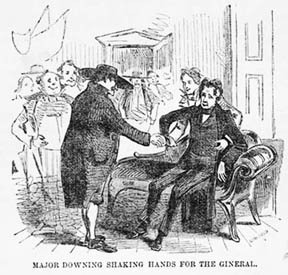 Peterkin Wishes to Go to Drive,' by Lucretia Peabody Hale. On Mondays we are serializing the 1890 book 'Samantha Among the Bretheren' by Josiah Allen's Wife (Marietta Holley). Today is Chapter Twelve, 'A Strain on Wimmen." 'Mr. Bowser Buys A Pig' from 1902 by C. B. Lewis. Mister Ron would love to hear from readers who know more about David L. Roath, or have access to copies of ROATH'S MONTHLY MAGAZINE from 1853! While Mister Ron generally abhors dialect humor, sometimes a story is so side-splittingly funny, irrespective of the characters' accents, that it is worth reading. This is one of them. Here is the FIFTH of the 'Five Love Adventures of Solomon Slug' by David L. Roath, from 1852 -- the story of 'Miss Jinks,' featuring the most -- ummm -- unique romantic serenade of all time. Oh yes, the expression "O. P. H."? While lost in antiquity, we can assume that back in 1852, everyone knew it meant "Out Post Haste." Anybody have any other guesses? Continuing this week with MORE from 'The Five Love Adventures of Solomon Slug and Other Sketches' by David L. Roath, from 1852. Today we present the fourth Love Adventure, 'Miss Araminta Higgs.' It's a bit lengthy, but it's a scream. Also, you'll get to find out exactly what a Sandingabob is! On Mondays we are serializing the 1890 book 'Samantha Among the Bretheren' by Josiah Allen's Wife (Marietta Holley). Today is Chapter Eleven, "Waiting." If you haven't heard the first ten chapters, you really ought to go back and get them! From the 'Five Love Adventures of Solomon Slug and Other Sketches,' the 1852 book by David L. Roath, we bring you one of the 'Other Sketches' -- next week we will bring you the remaining two 'Love Adventures' and a couple more sketches. On Mondays we are serializing the 1890 book 'Samantha Among the Bretheren' by Josiah Allen's Wife (Marietta Holley). Today is Chapter Ten, "The Monument." If you haven't heard the first nine chapters, you really ought to go back and get them! Mr. Bowser is the progenitor of Ralph Kramden, Archie Bunker, and even Homer Simpson. He is crass, stupid, headstrong, and has a fierce temper that is beyond belief. William J. Kountz Jr. relates a truly wild time in the Big Town in the riproaring 1899 Blly Baxter letter 'In New York." Billy Baxter tells about being 'In Love,' a screamingly funny 1899 tale from William J. Kountz, Jr.
William J. Koontz created an enormously popular character called Billy Baxter back in 1898. Soon afterward, he compiled a book of already published and new Baxter letters, but died at the age of 32, before they could be polished up and printed. Nevertheless, the collection of wildly humorous letters was released to reader acclaim in 1899. This week, we present some of these letters. On Mondays we are serializing the 1890 book 'Samantha Among the Bretheren' by Josiah Allen's Wife (Marietta Holley). Today is Chapter Nine, "The Funeral." NEW Weekend Series starting next week! We have more social and political satire from Maine humorist Seba Smith -- Learn how folks got rich quick in the 1830s -- not like today -- in 'Cousin Ephraim Explains The Science Of Land Speculation' from 1833.